Born in the province of Ontario in May 1967, Chief Warrant Officer Saunders enrolled in the Canadian Armed Forces as an Infantryman in January 1987 but was trade re-assigned that same month as a Weapons Technician Land. Following his QL3, Chief Warrant Officer Saunders was posted to 202 Workshop Depot in January 1988 where he completed his QL4 training in January 1991 and QL5 in March 1992. In July 1992, Chief Warrant Officer Saunders was posted to 1 Service Battalion Calgary as a second line technician. While there, he deployed to Norway as a member of the NATO ACE Mobile Force – Land. In January 1994, he was posted to the Lord Strathcona’s Horse (Royal Canadians) and deployed with that unit to Visoko Bosnia as a member of the United Nations Protection Force. Following the tour, Chief Warrant Officer Saunders remained with the unit as a 1st line technician in HQ and B Squadron moving with the Regiment to Edmonton in June 1996. In March 1997, Chief Warrant Officer Saunders was posted to the RCEME School as an armament instructor focusing principally on LAV and Leopard. In August 2001, Chief Warrant Officer Saunders was promoted to the rank of Sergeant. In July 2002, Chief Warrant Officer Saunders was posted to Maintenance Company 2 Service Battalion Petawawa as a Section Commander. In July 2003, he was posted to 3rd Battalion Royal Canadian Regiment but deployed that same month to Kabul Afghanistan as IC Ancillary Platoon, National Support Unit. 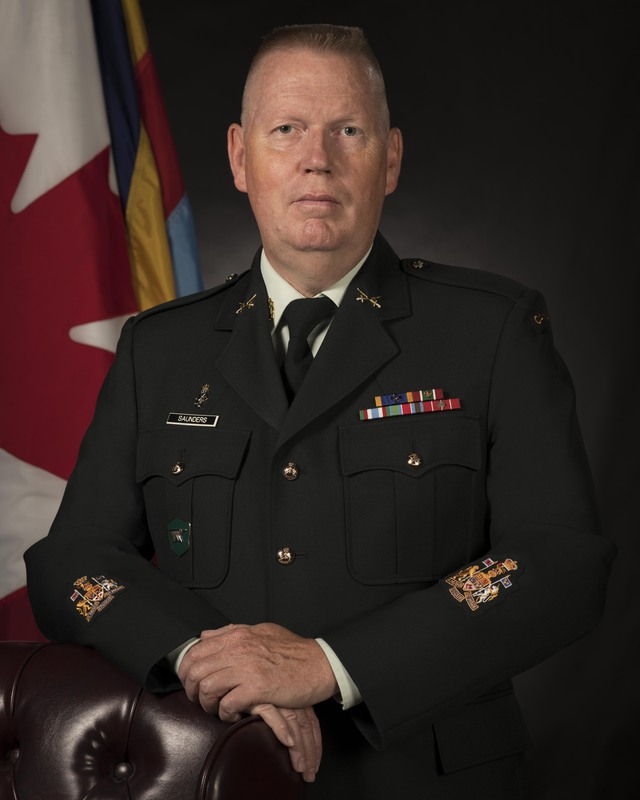 In April 2005, he was posted to the Royal Canadian Dragoons and subsequently promoted to Warrant Officer where he assumed the duties as IC Ancillary and Troop Warrant Officer. In August 2006, Chief Warrant Officer Saunders deployed to Kandahar Afghanistan as the IC Ancillary and Platoon Warrant of the National Support Element in support of the 1 RCR Battle Group. Promoted to Master Warrant Officer in 2008, Chief Warrant Officer Saunders was posted to the RCEME School as the Senior Technical Instructor Regimental Company. In 2010, he was named Company Sargent Major Artisan Company. In 2011, he was posted to the Advanced Training List for language training and then in July 2012, he was posted to Director General Land Equipment Program Management as a member of The Small Arms Modernization Project. Promoted to Chief Warrant Officer in July 2013, Chief Warrant Officer Saunders became the Directorate Armament Sustainment Program Management Chief Warrant Officer and Assistant Occupation Advisor for Weapons Technicians Land until he was appointed RCEME School Regimental Sergeant Major in June 2015. As of July 2018, CWO Saunders was appointed as the 23rd RCEME Corps Sergeant Major. CWO Saunders has been married to his wife Christine since 1991 and they have one son and one daughter, Ben and Emily.